Worried California vintners surveyed the damage to their vineyards and wineries Tuesday after wildfires swept through several counties whose famous names have become synonymous with fine food and drink. At the Gundlach Bundschu in Sonoma County, workers were not sure the grapes above the winery survived a second night of the fires that have destroyed at least two wineries and damaged more. 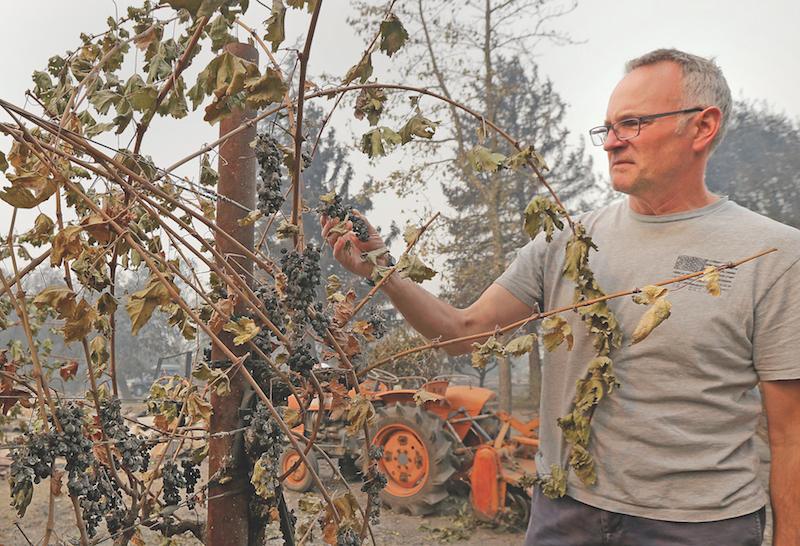 The speedy, wind-driven wildfires came as workers in both counties were picking and processing ripe grapes to make chardonnay, merlot and other wines that have made the region a global hot spot. Millions of locals and out-of-staters flock to Napa and Sonoma counties every year to sample wine, sit in mud baths and soak in the region’s natural beauty. The Napa Valley Vintners trade association reported that at least four wineries belonging to members suffered “total or very significant losses” while at least nine others reported some damage. The group emphasized that it had not heard from all members, especially those in the most vulnerable parts of the valley. About 90 percent of grapes had already been picked, the group added, with most of the remaining crop thick-skinned cabernet sauvignon grapes not expected to be affected by the smoke. Spokeswoman Charlotte Milan said Tuesday she could only confirm damage to the winery and a residence, explaining that workers had not been able to go on site. She said the estate’s 2015 reds and 2016 whites were stored off-site. The Paradise Ridge Winery in Sonoma County posted that it was “heartbroken” to announce that the facility had burned. She was optimistic that the fires will not affect the wines to come out of this year’s harvest. October 25, 2017 12:05 a.m.
August 26, 2014 12:15 a.m.